Joseph Brown Joseph "Joey" Francis Brown, 68, passed away on Thursday, October 20, 2016. 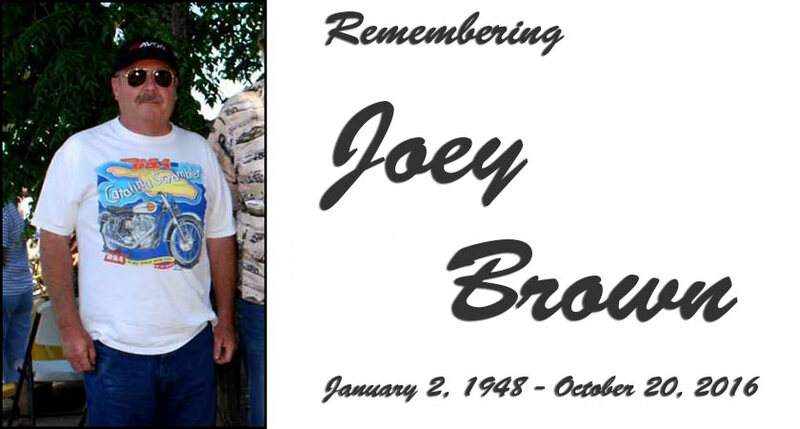 He was born January 2nd to Joe C. and Margaret Brown in Atascadero, Calif., but lived his entire life in Paso Robles. He carried the fifth generation name of Joseph Brown. Joey graduated from Paso Robles Union H.S. in 1966 celebrating his 50th class reunion this year. He was proud to serve his country in the U.S. Army. He completed his basic training at Ft. Ord and was stationed in Vietnam from November 1968 to September 1969. His life consisted of riding and racing motorcycles. Some of his racing highlights include winning the 1972 Ascot Gold Cup TT and Houston Astrodome TT Junior Nationals. He was also an avid off road racer. Joey also continued the family tradition of being involved in the Paso Robles Pioneer Day Parade showcasing his 1912 Indian motorcycle. Joey owned and operated Brown's Cycles, a family business handed down from generation to generation in Paso Robles from 1982 to 2014. He prided himself on providing honest, quality service. The business continues to run today with those same values. Joey was able to plan and attend the Brown's Cycles Racer's Reunion held on October 15, 2016. The Reunion consisted of his racing family and friends from over the years. The event was a huge success with over 300 people in attendance, bringing many smiles and memories to all. Joey was a devoted father and family man. He had a passion for teaching others the love of riding and working on motorcycles. All those who knew Joey will always remember the shop talk and track days they shared with him. Joey is survived by Patty Ferravanti, Arnette Demarest and Kathy Bryden Brown; sons: Ronnie, Daniel and David; stepson: Ron Hinton; sisters: Patricia Silveira and Janet Tullock.